Going back to my school days I was not the brightest pupil. I have to be honest; in the classroom I was useless. I hated English. I hated maths and I couldn’t draw! But, outside the classroom it was a totally different story. I had a talent with sport. I seemed to do really well at it. As I was growing up I got into reading short books and I quite enjoyed them. As I got older I got into more teenager books and again quite enjoyed reading in my own space. When I got to secondary school that’s when all the problems started. I just couldn’t adapt to the books the class was reading and it was a real struggle. I wasn’t at school for very long. I kept missing classes for a while then gave up education and got a job in a garage doing all sorts of work except reading and writing. So that went on from thirteen years of age till I was seventeen. I decided to go back to college. I went and did a computer course because I did have good knowledge on computers and it would be a good starting point for me to get back into education. When I was doing the course I was doing well. Not just well, really well. So that went on from 1993 – 1995. Also, during that time I was confronted with a big problem. I was struggling with English and maths. There was this one time where the tutor asked us to do a piece of writing, just a paragraph, on a piece of hardware. I didn’t have a clue what to do so I found a computer book, found a paragraph on a piece of hardware and memorised it. When it came to the exam I wrote what was in the book and failed. I ended up leaving in 1995. The problem was getting to me so much that I had to get help. I went for counselling for several years but nothing. Tried hypnosis but had no luck. I couldn’t work out why I could be top at so many things but when it came to reading etc I was struggling. But at the same time I did focus on my strong points which were doing sport. Then when I went to the G.P. and asked for help, I was sent to see a specialist. The specialist asked me three questions and put me under mental health as schizophrenic. So before I was given that label by a specialist I was a trained martial artist, trained to end a fight within three seconds. I had a full car licence and a full bike licence and I had a girlfriend and all that was taken away from me with three questions. Shortly after I went to see a psychiatrist and he said to me, “you’re schizophrenic but we don’t know what it is. It’s a bit like Jekyll and Hyde. You will be on medication for the rest of your life and you’re not allowed to drive or ride”. Between then and now I haven’t been told much more about schizophrenia. Shortly after that, I was moved out from the family home because of problems with being bullied and spent the next three years in hostels. I moved to the flat I’m still in today in 2000, which is in supported housing with support workers. I had a lot of challenges with this, was very unhappy and not making progress, and there were many changes of support workers. I stayed indoors at home for years, making my appointments with psychiatrists and psychologists. I knew I would like to get a volunteering job on a farm. It’s something I have wanted to do for a long time. It’s something that doesn’t really involve reading or writing so as long as I can count how many chickens there are I should be good at the job. With a support worker, we made a list of five farms to visit. One of them was Spitalfield City Farm but at the time we didn’t make any progress on this. I went to volunteer in a cycling group at Hommerton Hospital because I wanted to see the other side of the NHS. There are two sides to everything and it was no different to being a patient but I did enjoy being involved with the cycling group. The NHS stopped funding the cycling group after one year and it came to an end. When I got a phone call to come to Crisis, I stopped all support and it’s been like that since. I mentioned to my neighbour once that I wanted to do English and maths courses but I didn’t want to go to college. Because he’s a Crisis member, he passed my details on to Annette at Crisis and she called me to come in for a chat. Annette is the first person to give me real individualised help and I am very grateful to her. She taught me how to use grammar and punctuation and she taught me how to write. It was the same with maths. If I had a problem I couldn’t work out, then Annette would sit with me and break the problem down in a way that was understandable. What Annette did for me in a short space of time no doctor, no therapist and no support worker could do for me in twenty years. Annette even helped me fill out an application form to volunteer on the farm. Then, I found out I was dyslexic through Crisis. Not long after I stopped my regular psychiatrist appointments too. You would think that finding out you’re dyslexic – having some answers and explanations! – would make you happy but if I’m very honest it makes me angry knowing that I had to suffer for twenty years for no reason. Even if I put myself to one side, I’m concerned about all the vulnerable people out there who have problems they don’t understand and don’t know how to deal with, can’t defend themselves, and have to go through unnecessary suffering. Since finding out I’m dyslexic a lot has changed for me. I learnt that if you need to get from A to B it can be straight forward for some people but for some people it can be difficult but it doesn’t mean it’s not achievable. With a few changes here and there to make things a bit easier you can get to your destination. So basically, iou take that problem and you break it down,. Then you break it down again and again until you can make sense of it so you can still achieve your goals. When I’m writing it’s not straight forward. It’s all in bits and pieces: bits of the middle, bits of the end, bits of the beginning. Then it is all joined up to create something meaningful. Look at a computer as being a tool with a million different tools on it. You pick which tools you want to learn and use. That’s why it really helps to have computer knowledge because it gives me a way to understand my dyslexia. My experience in life has taught me that anger can be turned from negative to positive and can be used to your advantage. It does feel like I’m doing all this for the wrong reasons but to make those wrong reasons right. But now that I have the answer to my problem there is no stopping me. Although I do have a hard time reading because of my dyslexia, if I have to go to college in order to get a piece of paper so I can get my point across then I will. Bulend’s tutor from Crisis, said “Remarkable, determined, hardworking and brave, are all words that come to mind when describing Bulend Murad. Bulend has been attending Crisis Skylight since October 2011 and in this short time, has completely turned his life around. Before attending classes at Crisis, Bulend’s life was very different. Having suffered with issues affecting his mental health, Bulend was working very hard in therapy over the past three years. However, Bulend faced many challenges day to day and had low confidence. He found the simple things, like leaving home and going shopping, difficult as he found being in groups a challenge. He had a lack of energy, mainly due to his medication, and often slept for twelve hours a day. Bulend was referred to Crisis through a friend he met in supported housing. He was quite shy and nervous about attending. However, he signed up to study literacy and numeracy, which were currently at a high entry level 3 level. Despite being anxious in a class setting, Bulend’s attendance was fantastic – he worked hard and often asked for extra work to do outside of class. He worked extremely well in small groups and had a patient, caring and considerate working relationship with his peers. He often spent time patiently helping others in the group. Bulend’s enthusiasm for learning continued over 2012. 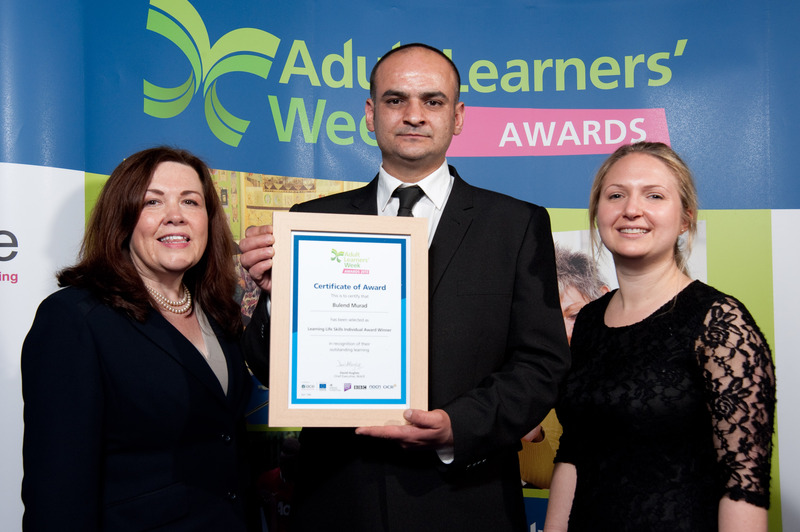 He enrolled and had outstanding attendance on a range of courses at Crisis including: Museum of Me (an art and personal development course); Words for Work (learning the language used in employment) and ECDL. Through these courses Bulend has also achieved qualifications in Life and Living Skills and Employability Skills. 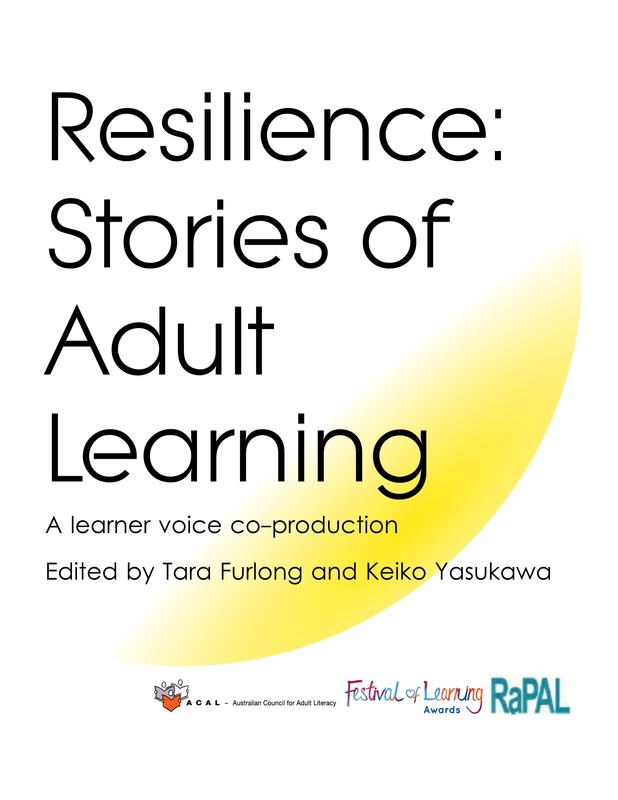 Despite finding some aspects of reading a challenge, Bulend has also attended the Crisis book club, where he has engaged in group discussion within a large reading group of 17-23 people. For someone, who finds group settings difficult, this is a huge achievement and a real example of how Bulend has succeeded in pushing forward his own personal boundaries. During a session in a literacy class, a task was set to research into a volunteering position and write a mock application. After discussing Bulend’s love of animals, we talked about the possibility of Bulend volunteering at Spitalfields Farm. He researched the position and took time writing an application. He was shortly asked for an interview. Bulend had only been for one interview previously, but did extremely well and got an ongoing position volunteering at the farm. He now volunteers there two days a week and has been described by the farm as a “real asset”. Simultaneously, Bulend had been part of a cycling group at Homerton Hospital. His enthusiasm for cycling led him to be asked to lead the hospital’s cycling group. When Bulend took over the hospital bike riding group, he got a note from the girl who he was taking over from saying:“The world is your oyster!” Bulend’s determination and motivation to learn, volunteer and engage with life has meant that he is building himself a really positive future. The farm has also recently approached him to discuss the possibility of him also running a cycling group for them. Furthermore, Bulend gave his time and energy last Christmas to volunteer with Crisis at Christmas. Despite disliking crowds, Bulend volunteered in the kitchen and enjoyed the sense of ‘giving back’. He is going to volunteer again this Christmas as a Kitchen Porter. After succeeding in completing so many courses at Crisis, Bulend and I discussed the possibility of him volunteering in an Entry Level Literacy course at Crisis. He filled in an application, did exceptionally well in the interview and now volunteers on a weekly basis as a Learning Support Volunteer. Bulend is fantastic working in the classroom. He has a great rapport with the learners and has a calm and patient manner. He has been excellent at supporting learners with spelling and reading. Bulend modestly stated that “I don’t know why but, in the past year, everything has gone right for me.” The truth is that he has shown strength and utter determination, overcome personal challenges and has truly turned his life around. He is now working hard to decrease his medication. He has grown in confidence and developed his own strategies to overcome fears and anxieties, so much so, that he is now helping so many others through his volunteering. He advises people to “not think so much but… just do” and is a true inspiration. Crisis is the national charity for single homeless people. Our purpose is to end homelessness. Homelessness is devastating, leaving people vulnerable and isolated. We believe everyone deserves a place to call home and the chance to live a fulfilled and active life. Lack of skills and qualifications can lead to people becoming homeless and keep them there, isolated from society, work and financial stability. Education is at the heart of Crisis – supporting people to build knowledge and skills, grow in confidence and feel more positive about the future. 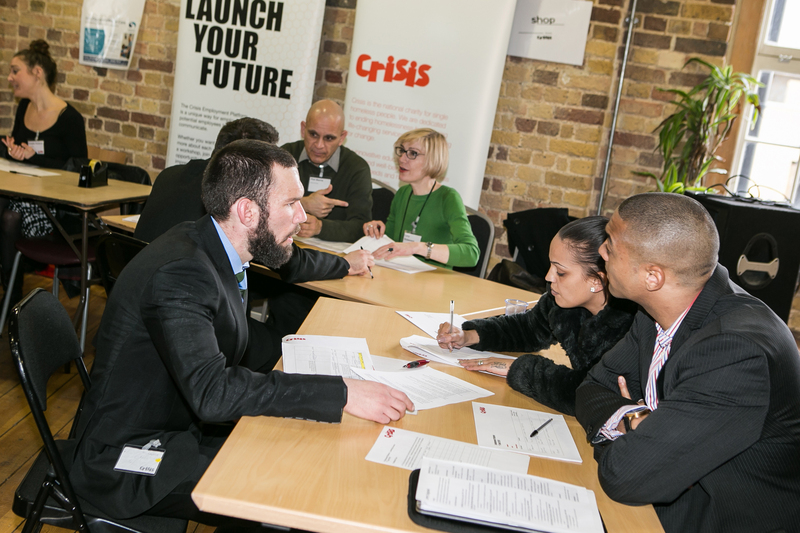 Crisis Skylight London offers practical and creative workshops in an accessible and inspiring environment together with formal learning opportunities that lead to qualifications and can help people to find work. Learning to use a computer at our IT classes moves people closer to employment and financial stability, while literacy and numeracy classes help people cope better with everyday life, budgeting or paying the bills. More than 1,700 people took part in a learning activity at Crisis Skylight London last year.